In response to a vital community need for effective transition information, programs, and services for young adults with disabilities and their families, the Golisano Foundation has teamed up with the University of Rochester to launch an Institute for Innovative Transition, an effort that will impact more than 900 families in Monroe County. The Institute will be housed at the Strong Center for Developmental Disabilities, a division of Golisano Children's Hospital at Strong. It is made possible thanks to a $600,000 grant from the Golisano Foundation, which aims to improve the quality of life for young adults with developmental disabilities and their families as they transition from school age to adulthood. "Every child has dreams for the future, but students with developmental disabilities often have difficulty realizing those dreams," said Ann Costello, director of the Golisano Foundation. "After two years of study and research, we are very proud to see this Institute become a reality because it will fulfill a critical role in addressing serious gaps in services in our community that make it very difficult for students to move from high school to further education or employment. Older students with disabilities will be able to better access services and new community-based options and have more opportunities to achieve their potential." The Institute's creation is the culmination of a two-year $150,000 partnership of the Golisano Foundation, the University of Rochester's Strong Center for Developmental Disabilities and Warner School of Education, and other community agencies to enhance the quality of life for young adults with developmental disabilities. 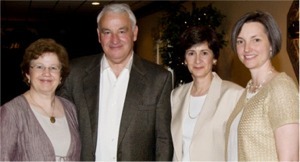 Over the past two years, the Golisano Foundation-funded activities included 1) a study to better understand the community's issues, challenges and opportunities for improving outcomes for disabled high school students and their families, and 2) a strategic plan to outline services that need to be developed to address the needs. The comprehensive and collaborative study with stakeholders was led by The Advocacy Center and the results were outlined in the Report: In the Balance: Successfully Transitioning to a Meaningful Adult Life, issued in December 2006. The Report is available at www.golisanofoundation.org. The new Institute will provide a robust and comprehensive set of initiatives to all constituencies - young adults with developmental disabilities, their families, schools, and adult service providers - involved in making transition a seamless, successful process. The services offered under this umbrella organization will include innovative pilot programs, improved information dissemination, technical assistance, training and professional development, and policy initiatives. The Institute for Innovative Transition will be under the leadership of Martha Mock, director, and Susan Hetherington, co-director. Mock is an assistant professor in teaching and curriculum at the Warner School and Hetherington holds joint appointments at the University of Rochester Warner School and in the Department of Pediatrics in the Medical School, where she is an assistant professor of clinical pediatrics and education. The Institute for Innovative Transition comes at a time when local young adults continue to struggle through the transition process from secondary education to the adult world. Low graduation and employment rates for these individuals in Monroe County are exacerbated by inconsistent transition planning and lack of employment and internship opportunities. In the City of Rochester alone, the graduation rate for students with disabilities is 17 percent; the statewide target for students with disabilities is 55 percent. In New York State, 20 percent of people with developmental disabilities are gainfully employed full time as adults and only 16 percent of these individuals without a high school diploma participate in the labor force. "This investment is a testament to the confidence that the Golisano Foundation has in the Rochester community to improve the staggering low graduation and employment numbers for people with developmental disabilities," said Mock. "Securing employment, and the confidence that comes from meaningful school experiences that lead to employment, is crucial for adolescents with developmental disabilities to become contributing members of our community." chances for a smoother transition to young adults with disabilities and their families. secondary programs to better prepare young adults with developmental disabilities for a meaningful and productive adult life. counselors, service coordinators, and adult service providers regarding the transition planning process and supporting choices after high school to improve the likelihood of a smoother transition. childhood to adulthood to support them in preparing for a meaningful and productive adult life. Families, students, agencies, and schools have been and will continue to be fundamental to this effort. The Institute has already developed a number of key partnerships with organizations, including the Finger Lakes Developmental Disabilities Services Office (FLDDSO), Midwestern Regional Transition Coordination Site, Monroe I BOCES, Monroe 2-Orleans BOCES, the Rochester City School District, and adult-service providers such as Lifetime Assistance and the Arc of Monroe. "For transition to be successful, students with developmental disabilities and their parents need partners from across the community," explained Jeanne Ricigliano, the parent partner at the Midwestern Regional Transition Coordination Site. "When these students transition, they are transitioning into the real world - our community, so it's important for them to have community partners that can build opportunities, be a resource, and most importantly be a champion. Everyone needs a champion, and that's especially the case for children with disabilities." 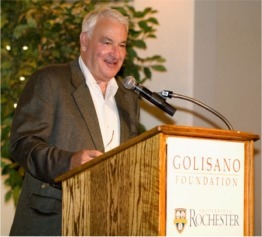 Founded in 1985 by B. Thomas Golisano, the Golisano Foundation supports programs and initiatives that will help individuals with developmental disabilities achieve their maximum potential by integrating independence, self-determination, and productivity into all facets of their lives. The Foundation also serves as a proactive partner with service providers, organizations, and the community to enable those with disabilities to more fully participate in the life of the community and to create an environment of dignity and care for disabled individuals and their families. Since its inception, the Foundation has awarded more than $12 million in grants to not-for-profit organizations that serve individuals with developmental disabilities. The Strong Center for Developmental Disabilities (SCDD), a University Center of Excellence for Developmental Disabilities, is a federally designated interdisciplinary division of the Department of Pediatrics involving faculty and students from divisions, departments, and schools of the University of Rochester, as well as other area institutions of higher learning. SCDD provides services, interdisciplinary training, research, and community education and technical assistance to children with disabilities, their families, schools, and providers.